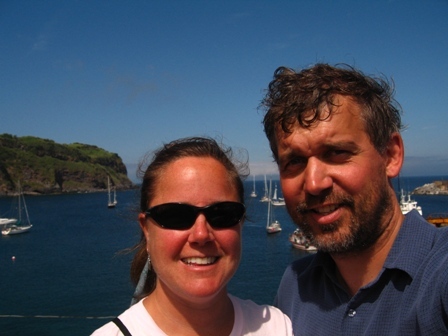 After sailing 17 days, 1850nm (2130 miles) we finally dropped anchor in Porto das Lajes on the island of Flores in the Azores. 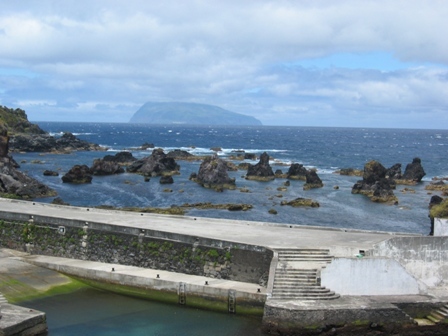 Flores in the most western island of the 9 islands of the Azorean Archipelago, making it the most extreme western point of Europe, located 39° 25’ N and 30° 54’ W and lies along the Mid Atlantic ridge. Its surface area is 143 sq km (55 sq miles), 17 km (16.7 miles) in length and 12.5 km (7.7miles) in width. 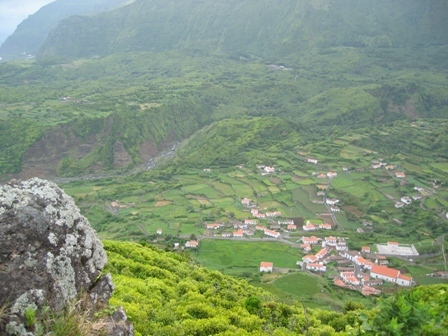 The highest point on the island is Morro Alto at 914 meters. Supposedly, Flores was discovered and settled between the years of 1450 and 1452 by the Portuguese navigator Diogo de Teive. 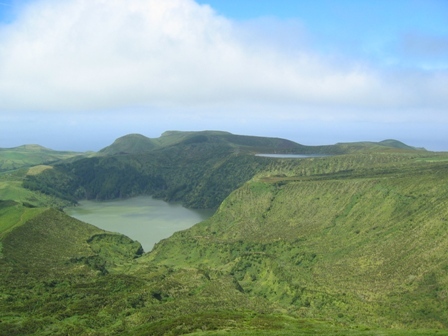 However, due to its isolation, the settlement stopped and only restarted in 1504 with settlers coming from Terceira and the Madeira Islands. In 1475, due to the abundance of flowers (Flores) the island was given the name Flores. 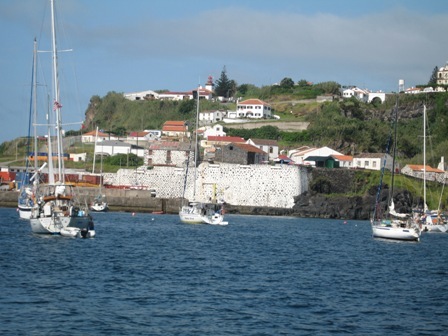 Once we dropped anchor, Marco and I raised the quarantine flag, pumped up the Zodiac and headed into shore to clear customs and explore the town of Porto das Lajes. Our first step on land was a very weird feeling. The earth continued to rock and roll underneath us for quite a while. In fact, we were both looking over the tall sea wall and quickly realized that we should save that until later once we have our balance back again. 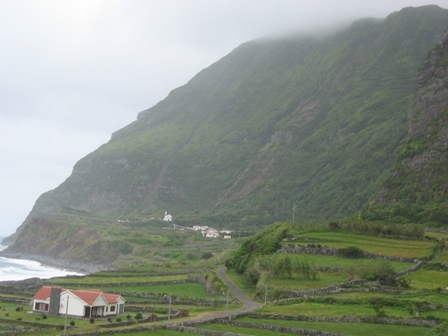 The town of Porto das Lajes is situated on a steep hill and the houses are all white with red roof panes. There are many beautiful flowers along the cobblestone roads and on the hill sides (red and yellow calla lilies, hydrangeas, blue agapanthus, pink climbing roses, morning glories and thick deep green ferns and bamboo in the thickets). 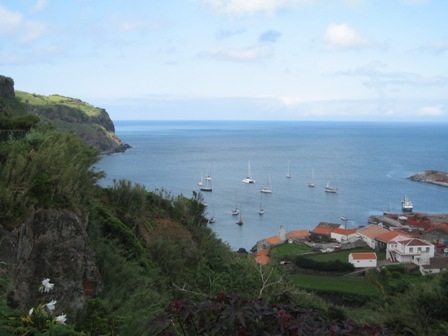 Marco and I walked up the steep streets and took in the view of the big ocean that we had just crossed. The water here is crystal clear and a turquoise blue in color. After exploring the small town we headed for Beira Mar café and restaurant where all the visiting yachtsmen come to meet one another, drink Sagres (the local beer) and we watched England play Trinidad in the World Cup Soccer tournament (England won 2-0). This is where you also come to place an order for the day’s fresh fish and vegetables and they will be delivered there in the afternoon. You can also order your diesel here and you can even drop off your laundry there where it will be line-dried and ready to be picked up in 24 hours. Great idea but we are on a budget so we will head for the laundry-mat in town today. After a quick dinner back on board Dalliance Marco and I headed back into town to a little stand that had white lights hung over picnic tables and a view of the harbor where I got some ice cream and Marco got another Sagres. This is also where all the locals come and hang out in the evening and it was quite the happening place. Afterwards we headed back to the boat where both of us were very excited to sleep in our bed instead of on the couches in the salon where we had slept during the crossing so that we could wake the other person up if needed in a hurry. Today we hired a taxi driver named Silvio who gave us a fantastic tour around the island of Flores. We took along our new friend David from Belgium and had a great time. Here are a few pictures of the beautiful sites we saw along the way!!!! This is called the Monument of Flores. 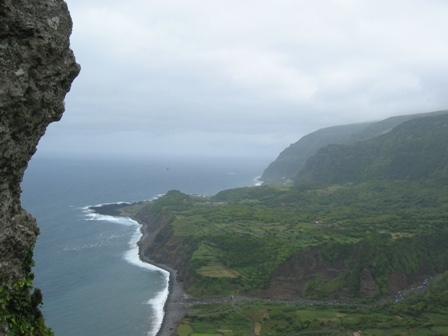 Rocha dos Bordoes (Organ Pipe Rocks) is a very dramatic looking volcanic formation of solidified basalt. The forests are made up of bamboo, Japanese Fir trees, hydrangeas, and Eucalyptus. One of the many small villages tucked in the valleys with the typical terraced farm fields and stone walls separating the properties. 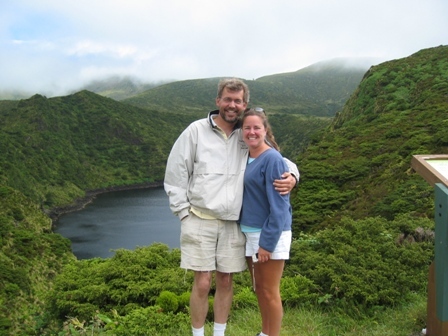 One of 7 crater lakes that are on Flores. The shallowest one is approximately 12 m deep and the deepest is 117 m. The color differences of all of them is really amazing. They are all protected natural reserves and farming is not allowed near them so they don't become contaminated with fertilizers and run off. 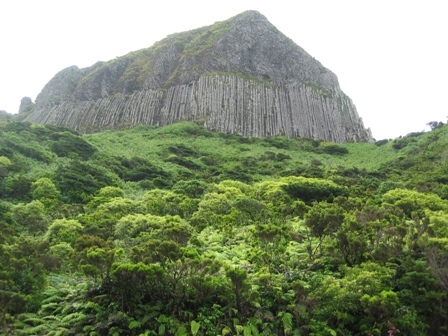 Fifteen miles to the northeast of Flores lies the island of Corvo. Seen here from the town of Santa Cruz on the east coast of Flores. 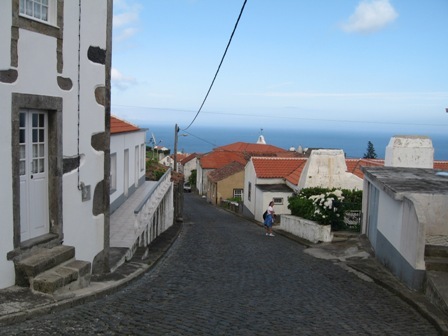 There is only one town on Corvo, Vila Nova, which has one policeman and 2 taxi drivers. The rock barely discernable at the horizon is the western most land of Europe. This is a good picture that shows the rugged coast line that is present throughout the island of Flores.